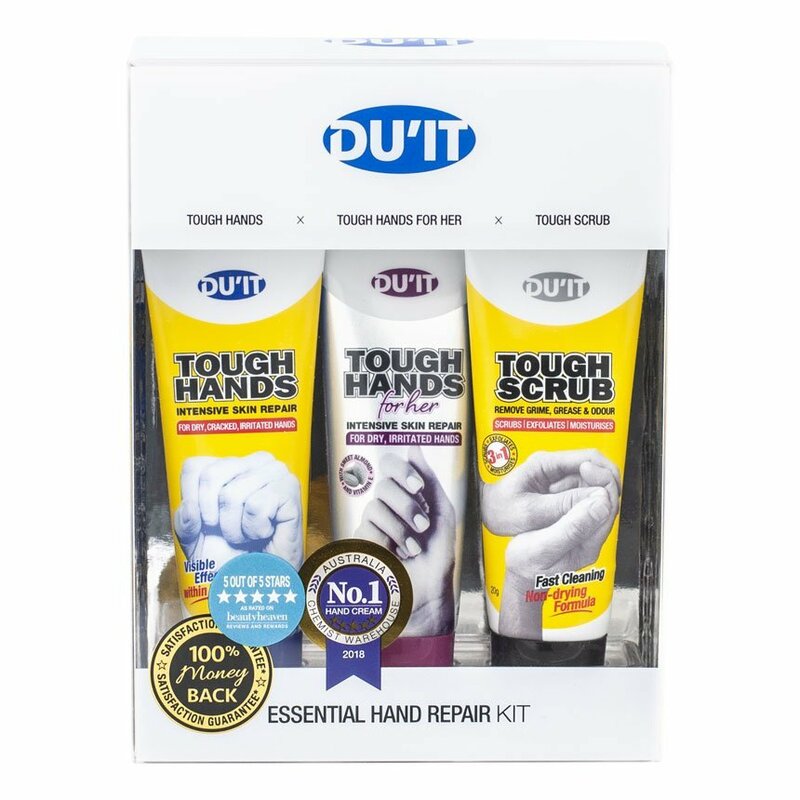 An essential hand repair kit especially formulated to provide instant relief, day and night, to dry, irritated or dull hands. Cleanse, exfoliate, repair and hydrate hands to reveal a visibly smoother, brighter and more refined complexion. 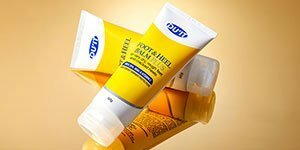 Concentrated with moisturising active ingredients, essential oils and natural ingredients, DU’IT products are free of parabens, petroleum, lanolin, allergens and irritants. 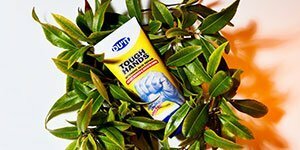 DU’IT Tough Hands is our original best seller with anti-microbial properties, scientifically formulated for the most stubborn cases of chronically dry, rough, cracked, irritated and calloused hands. It works to seal cracks, replace lost oils, condition the skin and form a protective barrier to keep hands in top condition. DU’IT Tough Hands for Her is scientifically formulated as a potent, hydrating hand moisturiser with anti-aging properties. Designed to guard against premature aging, visibly brighten and condition skin, cuticles and nails and increase moisture levels with long-lasting hydration. Contains a powerful peptide blend that supports natural collagen and softens the appearance of fine lines and wrinkles, panthenol for firming and niacinamide for skin elasticity. Its non-greasy protective barrier shields skin from harsh environmental stresses and neglect while locking in skin moisture to keep skin highly hydrated. DU’IT Tough Scrub is exclusively formulated to compliment Tough Hands and Tough Hands for Her. Fortified with premium skin conditioners, it is a 3-in-1 scrub that cleans, exfoliates and moisturises, leaving hands soft and smooth. The natural, non-irritating and gentle scrubbing particles gently lift away dead skin cells whilst removing difficult cases of grime, grease, oil or odours such as seafood or garlic. Unlike other heavy-duty hand cleansers, it contains no drying solvents, harsh detergents,harmful chemicals, alcohol or ammonia which leave your hands dry and chapped. Tough Hands: Aqua/Water/Eau, Urea, Lactic Acid, Cyclopentasiloxane, Hydroxypropyl Starch Phosphate, Glycerin, Dimethicone, Ethylhexyl Palmitate, Cetearyl Alcohol, Glyceryl Stearate, Stearyl Alcohol, Sodium Lactate, PEG-100 Stearate, Ceteareth-20, Myristyl Myristate, Polysorbate 20, Tocopheryl Acetate, Sodium PCA, Sorbitan Laurate, Silica, Lauryl Pyrrolidone, PEG-20 Stearate, Piroctone Olamine, Backhousia Citriodora (Lemon Myrtle) Leaf Oil, Leptospermum Petersonii (Lemon Tea Tree) Oil, Disodium EDTA, Benzyl Alcohol, Benzoic Acid, Sorbic Acid, Parfum (Fragrance). Tough Hands for Her: Aqua/Water/Eau, Urea, Lactic Acid, Cyclopentasiloxane, Hydroxypropyl Starch Phosphate, Glycerin, Dimethicone, Ethylhexyl Palmitate, Cetearyl Alcohol, Glyceryl Stearate, Stearyl Alcohol, Sodium Lactate, PEG-100 Stearate, Niacinamide, Panthenol, Prunus Amygdalus Dulcis (Sweet Almond Oil), Ceteareth-20, Myristyl Myristate, Polysorbate 20, Tocopheryl Acetate, Sodium PCA, Sorbitan Laurate, Steareth-20, Silica, Lauryl Pyrrolidone, PEG-20 Stearate, Palmitoyl Tetrapeptide-7, Piroctone Olamine, Disodium EDTA, Benzyl Alcohol, Benzoic Acid, Sorbic Acid, Parfum (Fragrance). Tough Scrub: Aqua/Water/Eau, Paraffinum Liquidum, Sodium Laureth Sulfate, Ceteareth-20, Glyceryl Stearate SE, Glycerin, Aluminium Silicate, Cetearyl Alcohol, Isopropyl Palmitate, Cocamide MEA, Cocamidoproply Betaine, Juglans Regia (Walnut) Shell Extract, Sodium PCA, Tocopheryl Acetate, PEG-120 Methyl Glucose Dioleate, Sorbic Acid, Benzoic Acid, Sodium Chloride, Disodium EDTA, Tromethamine, Benzyl Alcohol, Parfum (Fragrance), Hexyl Cinnamal. Tough Hands: Apply a thin layer daily to clean hands and as a night mask under gloves, if required. Ideal for skin conditions, repeated washing, prolonged use of latex gloves, chemicals, solvents, cement, cleaners, abrasive soaps, detergents and contact with other allergens and irritants. Tough Hands for Her: Apply a thin layer daily to clean hands and as a night mask under gloves, if required. 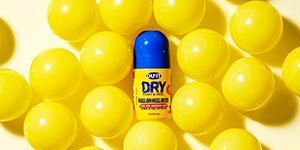 Ideal for skin conditions, sun and harsh weather damage, aging, post exercise, domestic chore wear and tear, repeated washing and contact with other allergens and irritants. Tough Scrub: Start with dry hands. Rub into hands adding a few drops of water as you continue to cleanse and exfoliate. Rinse well. Repeat if necessary. Wipe dry. Ideal for in-home domestic, commercial and industrial applications, anytime cleansing or whenever exfoliation is required. Tough Hands is our original best seller with anti-microbial properties, scientifically formulated for the most stubborn cases of chronically dry, rough, cracked, irritated and calloused hands. It works to seal cracks, replace lost oils, condition the skin and form a protective barrier to keep hands in top condition. 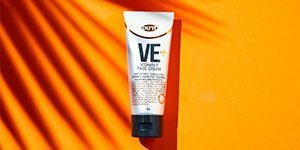 It is non-greasy, easily absorbed and free from lanolin, parabens, petroleum chemicals and artificial fragrances making it suitable for even the most sensitive skin types. Tough Hands for Her is scientifically formulated as a potent, hydrating hand moisturiser with anti-aging properties. Designed to guard against premature ageing, visibly brighten and condition skin, cuticles and nails and increase moisture levels with long-lasting hydration. Contains a powerful peptide blend that supports natural collagen, and softens the appearance of fine lines and wrinkles, panthenol for firming and niacinamide for skin elasticity. Its non-greasy protective barrier shields skin from harsh environmental stresses and neglect while locking in skin moisture to keep skin highly hydrated. Visible effects within 5 days, Tough Hands for Her fixes hand problems that beauty hand creams won’t fix. It provides long-lasting protection from damage to hands caused by repeated washing, prolonged use of latex gloves, chemicals, cleaners and contact with other allergens and irritants. Tough Scrub is exclusively formulated to compliment Tough Hands and Tough Hands for Her. Fortified with premium skin conditioners, it is a 3-in-1 scrub that cleans, exfoliates and moisturises, leaving hands soft and smooth. The natural, non-irritating and gentle scrubbing particles gently lift away dead skin cells whilst removing difficult cases of grime, grease, oil or odours such as seafood or garlic. Unlike other heavy-duty hand cleansers, it contains no drying solvents, harsh detergents,harmful chemicals, alcohol or ammonia which leave your hands dry and chapped. No. We only use carefully-selected substances in our products to guarantee the safest ingredients. All of our product formulations are free from drying alcohol, parabens, petrolatum, phenoxyethanol, phthalates, mineral mils, lanolin and propylene glycol. DU’IT Skin Care upholds holistic principals but does not ascribe to a vegetarian or vegan philosophy. However the Essential Repair Kit does not contain animal or animal-derived ingredients. Our Glyceryl Stearate and Lactic Acid ingredients are derived from synthetic or plant extracts. An essential hand repair kit especially formulated to provide instant relief, day and night, to dry, irritated or dull hands. Cleanse, exfoliate, repair and hydrate hands to reveal a visibly smoother, brighter and more refined complexion. Concentrated with moisturising active ingredients, essential oils and natural ingredients, DU’IT products are free of parabens, petroleum, lanolin, allergens and irritants. This kit contains: • Tough Hands 20g • Tough Hands for Her 20g • Tough Scrub 20g Tough Hands is our original best seller with anti-microbial properties, scientifically formulated for the most stubborn cases of chronically dry, rough, cracked, irritated and calloused hands. It works to seal cracks, replace lost oils, condition the skin and form a protective barrier to keep hands in top condition. It is non-greasy, easily absorbed and free from lanolin, parabens, petroleum chemicals and artificial fragrances making it suitable for even the most sensitive skin types. Tough Hands for Her is scientifically formulated as a potent, hydrating hand moisturiser with anti-aging properties. Designed to guard against premature ageing, visibly brighten and condition skin, cuticles and nails and increase moisture levels with long-lasting hydration. Contains a powerful peptide blend that supports natural collagen, and softens the appearance of fine lines and wrinkles, panthenol for firming and niacinamide for skin elasticity. Its non-greasy protective barrier shields skin from harsh environmental stresses and neglect while locking in skin moisture to keep skin highly hydrated. Visible effects within 5 days, Tough Hands for Her fixes hand problems that beauty hand creams won’t fix. It provides long-lasting protection from damage to hands caused by repeated washing, prolonged use of latex gloves, chemicals, cleaners and contact with other allergens and irritants.